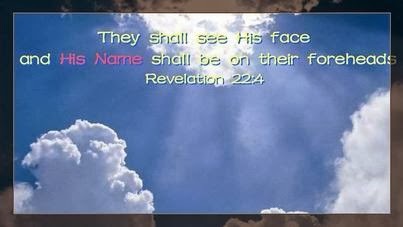 SUBJECT: "The Name of Father written on their foreheads"
God puts so much emphasis on His Name that He even wants to write His Name on our foreheads if we are faithful and true to Him. Here, we see the unshakable proof of the great significance of Yahweh’s Name, all the way to Revelation, the last book of the Bible. To have God’s Name written on our foreheads means to have the ‘seal’ of God. It means that God's mind and character so fill our lives that we too also manifest the qualities of Yahweh God: full of mercy, grace, goodness, justice, steadfast love, and faithfulness. Revelation also talks about the name of the beast. Will you have the name of God on your forehead or will you have the mark of the beast?